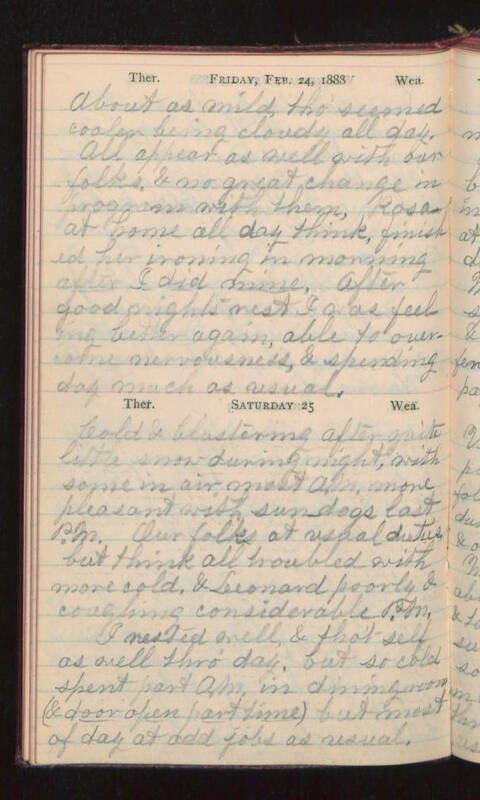 Friday, Feb 24 1888 About as mild, tho' seemed cooler being cloudy all day. All appear as well with our folks & no great change in progress with them, Rosa at home all day think, finished her ironing in morning after I did mine, After good night rest I was feeling better again, able to overcome nervousness, & spending day much as usual. Saturday 25 Cold & blustering after quite little snow during night, with some in air, most A.M. More pleasant with sun dogs last P.M. Our folks at usual duties but think all troubled with more cold & Leonard poorly & coughing considerable P.M. I rested well, & that self as well thro' day, but so cold spent part A.M. in dining room (& door open part time) but most of day at odd jobs as usual.